Phil follows up last week's win with another, leading half the race from Kcender, who lost the race lead after apparently opting to put in a big fuel load at his stop. Congratulations to Kcender on pole and to Phil.8 for the race win. I have to call the start accident a racing incident: Matthew was faster than Russ in front of him, and at the same time, Mael got the jump on KCender who bogged down in front of him, and had to go around. 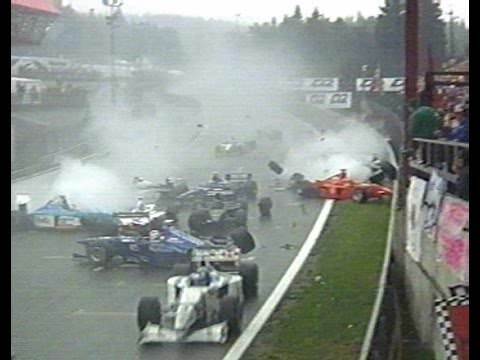 As a result of that, Mael and Matthew tangled wheels in a side-to-side impact, that was probably difficult to avoid on a starting grid three cars wide. Phil manages to pull clear of Kcender to take the championship lead. car was a nugget, something happened at the start i think i tagged someone next to me who got a good start as i was moving to dodge the slow starting car in front, got damage car was horrendous so put it in the wall where it belongs. Bugger. First time in a while I've had time to join in. No practice but I was enjoying it, but somehow my race setup didn't save and I ran out of fuel after 5 laps. Overall a pretty uneventful race after the start, just tried to keep it clean, pitted early to fix all the red bits and a clean run to the end. also - did anyone else need 170+ litres to make the race or the DFV in the Lotus rather thirsty ? Results are up in the first post. Nearly... then nearly Matthew... but in the end, couldn't really single anyone out for blame. Yep, 160-ish for me in the Surtees. It comes down to the track having a high full throttle percentage. I managed to pick my way unscathed through the start incident - I think I was about 7th from a start of 15. But then my bogey corner, Stowe (the 90 degree right hander) caught me out twice in the next two laps, with me botching my downshifts and sliding off onto the grass and into the embankment and copping wing damage - an off that didn't happen in all of practice, of course. That put my down in 18th for a while, but I climbed back up. I had some good pressure put on me by Jeremy and later Rob, who both seemed to be able to enter the corners much faster than me, maybe with higher downforce. But then I could usually get a better exit speed and take off down the next straight. Jeremy reeled me in, but I managed to hold Rob off to the end, finishing only 0.2 sec in front of him, in some good pressure racing. 160 was more than enough for me, but I think I'm a little lighter on fuel and tyres than some of you fast guys. Got a little damage trying to avoid the carnage at the start, had a couple of good little battles. I went s/s/s with 100ltr start and 30ltr top up at both stops (30ltr seems to be about the same time as tyre swap), didn't bother fixing damage. I think I had my gearing and aero wrong wasn't as fast down the straights (aero damage too I suppose) and hit redline in the slip stream chasing Keith. Top ten finish but probably only because a few dropped out, Good fun thanks guys. An average saw me start in 9th. I got away reasonably but then tangle ahead happened. The gap was widening so I went to go through but then a second hit saw the spinning Mael bounced back and the gap closed! To late, I was in the middle!! Got going only to spin on the next corner with front wing damage. Had another small spin from clipping the grass a few laps later and then a pit for damage repair. Things were looking pretty dismal at this point. I decided to push on and hope to grab some points. I ran to lap 28 on hards then topped her up with softs for the final stint. The softs hung in well, setting my best lap on the 2nd last one. Mael was chasing hard for much of the final laps (to lap me) but I was able to hold a sufficient gap to not succumb to the blue flags. Ended up being an enjoyable run despite not really feeling comfortable on this track. I had 109 + 59 Fill ( 168 total ) but had a few litres left at the flag. You must be a lead foot Russg. Caught up in the start straight carnage. Rear ended and taken out a few laps later. Two more small mistakes (half a tyre on the grass) with large consequences (head on into a wall). When I forgot to fix damage after the last one I rage quit. Missed the start incident, but couldn't get past Fly and got jumped by about three cars. Then got caught up in one of their accidents. No biggie, just frustrated that it was early in the race and I had to pit which screwed my strategy. I ended up pitting a few more times because I took my wing off and then stuck it in a wall, needed to pit for tyres, tyres and fuel, and eventually finished 14th. Next week is either going to be awesome or the worst thing I have ever done. WooooHooo!!!!!! Let's see if I can do a timed lap. I seem to be alright at doing 8/10th distance on a warmup, but either screw up before the long straight, or just after and damage the car.